1	Combine rye and unbleached all-purpose flour and salt in a bowl. Use a fork to stir in the eggs until texture becomes raggedy and gradually stir in water. Batter will thicken. Be sure to remove any lumps found in batter. Set batter aside for 30 minutes. If batter becomes too thick add water until you reached desired consistency. 2	Heat an 8 in. skillet over medium heat and add clarified butter to it. Once pan is hot, add enough crepe batter to thinly layer the entire bottom of the pan. Cook until crepe is browned and flip. Cook the side until brown and remove from pan. 3	Serve warm with your favorite toppings. 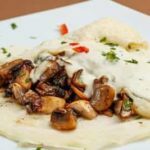 Sautéed mushrooms with some shredded Gouda transforms crepes into a savory treat. If you prefer a sweeter taste, we recommend honey, peanut butter or ricotta with some fresh fruit like banana slices or peaches. Whichever you prefer, you’ll enjoy these delicious and healthy crepes.